The goal was to take full advantage of handheld devices to create an intuitive and simple navigation scheme. We wanted to be true to delivering the experience of what it might have been like to stand in the middle of open prairie and imagine what a homesteading family might have felt like when they first arrived. The idea was to not depend on numbered signage, which would detract from the authenticity of the site. Since we had organized the information into separate story lines, we sub-divided each story into sub chapters that could be ordered in a logical sequence. By doing this we could use the swipe function to move between chapters like a person would if they were reading a book. In fact, a user could just use swipe function to navigate the entire app. 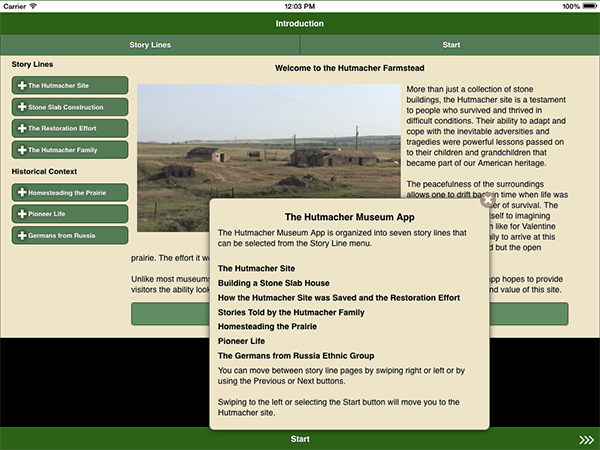 The story line menu can be accessed at any time and with a couple of taps a user can jump to any point in the app. 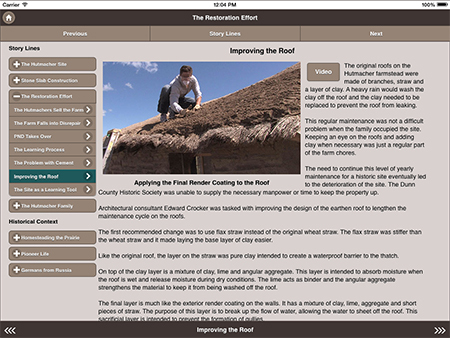 On tablets in the landscape mode, the story line menu is visible along with an indication of the story chapter being displayed. The App doesn't let you get "lost"
We made sure that if a user clicked on an object to get additional information or to view a video they would always be returned to the place where they started.